Would You Rather? 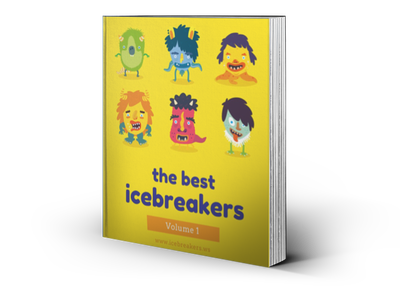 Game - Icebreakers, Icebreaker Ideas, Games, Activities! Ask the group to decide what they would rather do given two possible options. Take a poll, and then lead a short debate between the merits and disadvantages of each option. The questions can range from silly, to gross, to impossibly cool. This icebreaker can also be adapted to fit a theme, such as a holiday or study unit. Would You Rather is a dynamic activity that makes people think on their feet and gives insight into their priorities. Would You Rather is a good icebreaker for large or small groups and is most effective in 10 to 40 minutes sessions. This highly adaptable activity can easily be made age appropriate for young children, adolescents, and even adults. Small groups could use this activity in more of a debate style, while bigger groups might call out reasons for choosing one or the other. The goal of the icebreaker is to initial conversations across the group and for participants to discover things they have in common that might not be obvious otherwise. Make your list of questions. Would You Rather is easy to adapt to any event, grade level, or theme. The game can be played in a more formal or informal setting. See Tips and Notes for question ideas. Call the group together and explain your chosen rules. Designate one side of the room “Option A" and the other side “Option B." Ask each question and ask participants to move to one side of the room or the other, depending on which option they “would rather." Have each side explain their reasoning behind their decision. In a more formal game or a larger group, you could give each side a few moments to consult as a group and present their top three reasons for their choice. In a less formal game or smaller group, each person could say their top reason for their choice. After each group has had their say, move everyone back to the middle for their next question. Here are some question ideas to get you started. Would you rather be 10 feet tall or 10 inches tall? Would you rather live in outer space or at the bottom of the ocean? Would you rather be able to fly or able to run 50 mph? Would you rather swallow a bug or lick a frog? Would you rather sit in a room with a snake or a tarantula? Would you rather be bitten by a werewolf or a zombie? Would you rather travel 100 years back in history or 100 years into the future? Would you rather live in the desert or in the Arctic? Would you rather live forever or be remembered forever? Get-to-know-you Archives - Page 2 of 4 - Icebreakers,Ideas, Games, Activities! Word Chains - Icebreakers,Ideas, Games, Activities! Get-to-know-you Archives - Page 3 of 4 - Icebreakers,Ideas, Games, Activities!